As Carnegie explains, the majority of our success in life depends on our ability to communicate and manage personal relationships effectively, whether at home or at work. How to Win Friends and Influence People will help you discover and develop the people skills you need to live well and prosper. 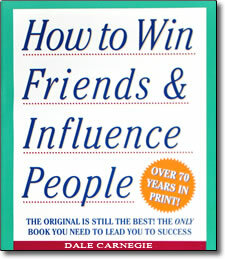 There is room at the top, when you know…How to Win Friends and Influence People. I loaned my 1950 s copy to a member of my family they said was such a good read they are still hanging on to it ! I love Dale Carnegie. Thank you for inspiring many people as well as changing our lives.